What do spiders and orchid plants have in common?. These plants look somewhat like spiders. Brassia orchid plant is the name given to these orchids, sometimes nicknamed "spider orchids". 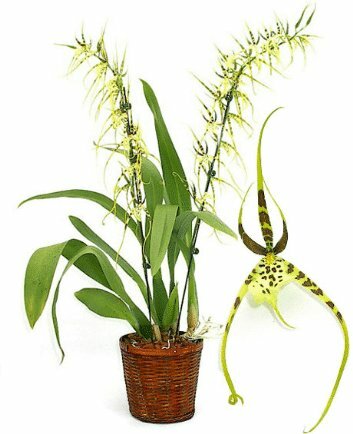 These beautiful orchids are from the Genus Brassia and are often called the spider orchids. The long and slender petals and sepals are a little like spider legs. Many species in the genus Brassia are pollinated by parasitic wasps, which normally lay their eggs on spiders. The patterns and structure of Brassia orchids resemble a spider in its web enough to encourage these wasps to lay their eggs in the plants' blossoms and in doing so pollinate them. These orchids are often extremely fragrant. Just after their blooming period these plants need a rest for several weeks. This means that the temperature should be kept on the lower end of the range, 55 - 60 degrees. With respect to watering, they need to be kept moist but not wet during their growing season. The growing period is when the flat pseudobulbs develop and when the inflorescence (flower spike) forms. After this period you should water only once a week. This is a discussion of the culture of the spider orchids. Check here for a discussion of the culture of other popular orchids.